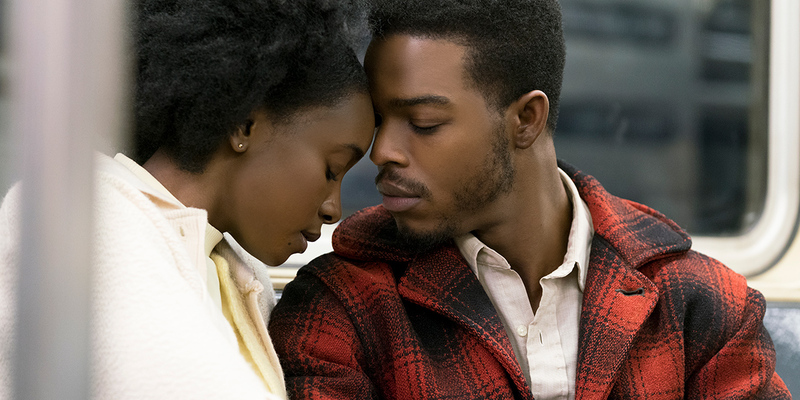 If Beale Street Could Talk review: Barry Jenkins follows up his Oscar-winning home-run Moonlight with a feature adaptation of the James Baldwin novel, a beautifully crafted love story in 1960s New York. So, follow Moonlight then, Barry. With such a steep hill to climb for his first film since his 2016 sleeper bagged the prestigious Best Picture Oscar from the clutches of La La Land, Jenkins chooses James Baldwin’s 1974 novel to adapt for the screen, a tragic tale of love, family, life and loss in the streets of Harlem. We meet Tish (Kiki Layne) and Fonny (Stephan James) at the start of the film, former childhood friends who have known each other forever, but have fallen in love and plan a big future. Tish is part of a loving family, but it’s clear that Fonny has chosen a different path than that of the wishes of his. He’s dropped out of school – taking some expensive wood shop tools with him but has put them to good work by carving out an interested in wood sculpture. He’s a good man and wants the best for him and Fonny. His morals are there – he wants to provide for them both, put a good roof over their heads and get a good job, but most of all he wants to ensure that the two are married before moving forward with having children. We learn very early on that Fonny has been arrested and charged with a crime – one that is he could never have committed – the specifics of which aren’t revealed until nearly halfway into the feature. We see the young 22-year-old in prison on remand awaiting trial where he is told by Tish that he is to become a father and then flashback to their time getting together as a couple, and the journey that leads them to their current predicament. We see Tish tell her family of her big news, and then the stand-out moment in the first reel where Fonny’s family are informed of the same – let’s just say they react in a very different fashion. Jenkins’ film is told through the eyes of Tish – the same as in the book – and is a stunning piece of work. The scenes that throwback to the one where she and Fonny get together are always accompanied by a huge dynamic shift in the soundtrack. Nicholas Britell‘s score is superb, a romantic symphony filling your ears every time we are sent back to witness how the two developed their love affair and peer in to see how it evolved. This aural treat is a cert for at least a nomination come Oscar time. The cinematography too is absolutely gorgeous, Jenkins once again teaming with his Moonlight DOP, Oscar nominee James Laxton – a retro feel of period Harlem, New York perfectly captured – a feast for the eyes – a stunning pastel palette of so perfectly captured. The camera angles also stand out, the filmmakers opting to, at various points, have the actors looking directly into the camera to deliver dialogue, a purposeful move by Jenkins, and another element contributing the immersion that you feel whilst watching it. This faithful adaptation is an absolute masterstroke from Jenkins, the film feeling very much more polished than his previous work/ The acting is top drawer, the two leads in Layne and James pitch-perfect, both of them called upon to deliver emotion at various points without any use of speech, and they pull it off perfectly. There are also fleeting appearances from the likes of Diego Luna, Pedro Pascal, and Dave Franco, are reduced to single scene inclusion. The film is full of passion, delivered with such precise, balletic precision and is absolutely thing of absolute beauty. With its serious subject matter and resonating political and social message, you’d be hard pressed to find anything else like it in cinemas this year. An absolutely perfect piece of art. If Beale Street Could Talk review by Paul Heath, September 2018. If Beale Street Could Talk was reviewed at the 2018 Toronto International Film Festival. Click here for all of our coverage. The film is full of passion, delivered with such precise, balletic precision and is absolutely thing of absolute beauty. One of the best films of 2018.